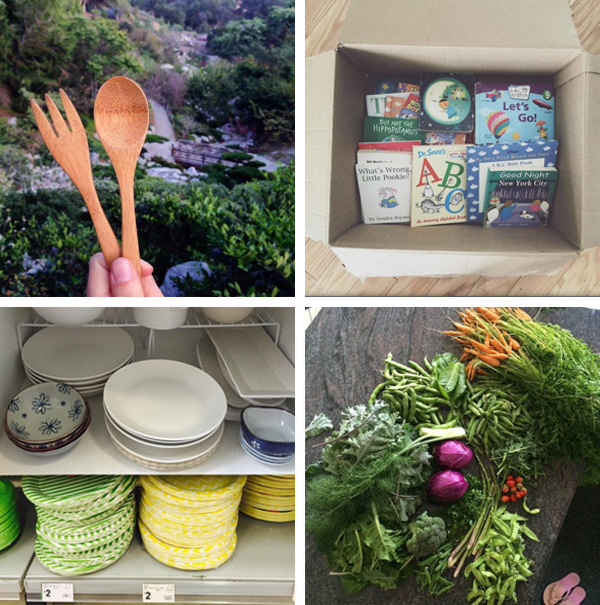 Last week, my plastic free and zero waste life, was exposed to a wide audience. My freckled face was appearing on national TV, my voice heard on radio here plus around the world, and my words were appearing in various publications. The opportunity, while unexpected, was humbling, daunting and exciting. I connected with so many wonderful people. I was feeling really good. Great, in fact. That was, until I realised, there's a huge chance things won't ever change for years, decades...or even in my lifetime. I might not ever see plastic packaged food and plastic water bottles vanish from shelves. I might not ever see landfill contribution decrease. It took me a couple days to let this settle over me. Things might not ever change in my lifetime, and I am okay with that. But I won't stop doing this. Every interview ended with the same question, "is this for the rest of your life?" This is how I want to live my life, regardless if others follow along, regardless of mass change. I will continue to share; continue to write and talk. When you find something that makes you happy, it's hard to stop. And I love living plastic free and zero waste. I am happy to keep doing what I can, with what I have got. Many people have been asking about my beetroot lip/cheek stain and the mascara I make. 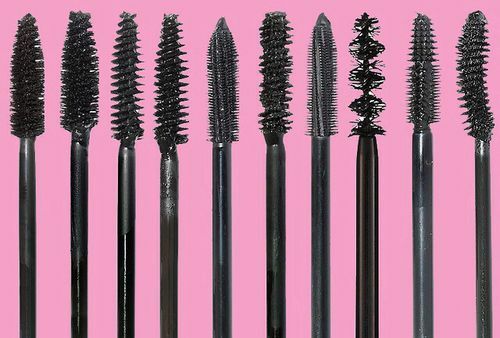 ...and many people, have been asking me, if they can buy zero waste and plastic free makeup. They were not asking me if I sell it (I don't, at least not yet). The questions were from people who have no inclination of making their own makeup BUT would love to buy makeup that allows them to reduce waste. Last night, I found two fantastic items. I asked the makers a heap of questions. Answers were sent back. And now, I have ready made makeup on their way to me to test. I will share reviews next year. My blender broke. It was purchased from Kmart way back when I moved in with the Builder. It is glass, sturdy and has whizzed up many a soup…and the odd green smoothie. I felt smelt its demise over winter. Each time I put my soup into the jug, turned the dial up and hit the button, there would be a faint burnt smell. I ignored it, until the thing would not turn on one day. Once upon a time, many moons ago, this blender would have gone into the bin OR I would have done something sneaky and dropped said item into a charity bin “expecting” someone to fix it. They don’t. Don’t do this. Most of the larger charity stores don’t take electrical goods, working or not. 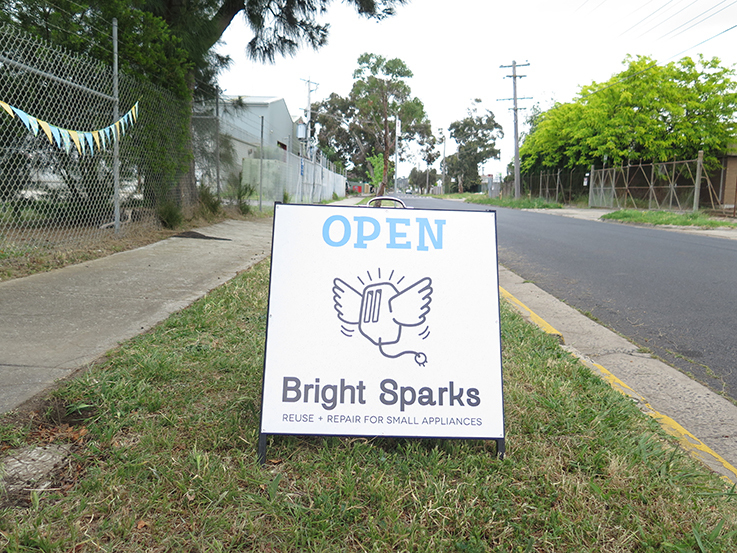 Enter Bright Sparks, a not-for-profit enterprise that endeavors to keep small appliances out of landfill. 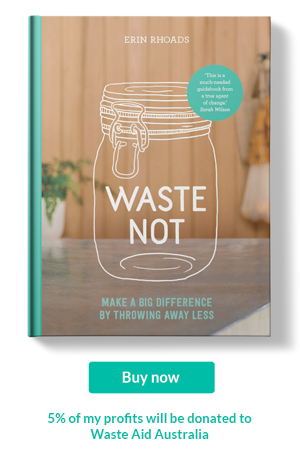 Right up this zero waste girls alley. So off I went, blender tucked under my arm and trained/bused it over to their store. 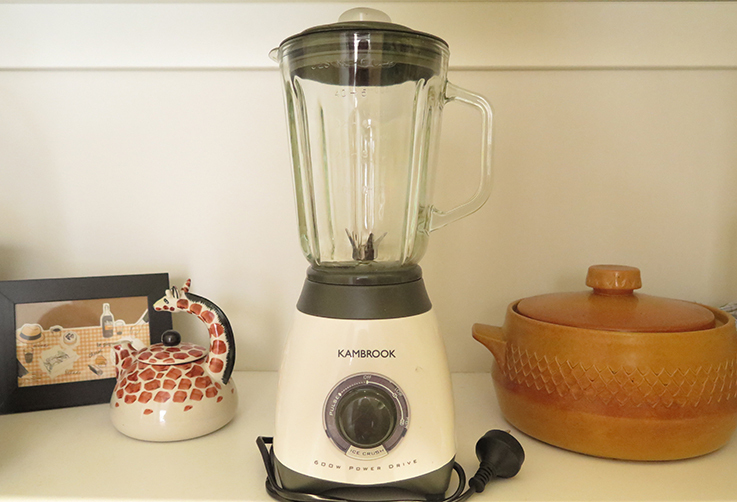 My blender was looked over, my name was taken, asked whether I needed it urgently (I said no) then I was told that I’d receive a call to let me know the prognoses of my blender. 6 days later, I got a call to say the motor had burnt out and a part would need to be replaced. I gave my blessing, then waited for the next call that all had worked. Well, all worked. And it’s back in my kitchen, blending and not smelling like burnt rubber. Total cost? $35. If it could not have been fixed, there would have been NO fee. 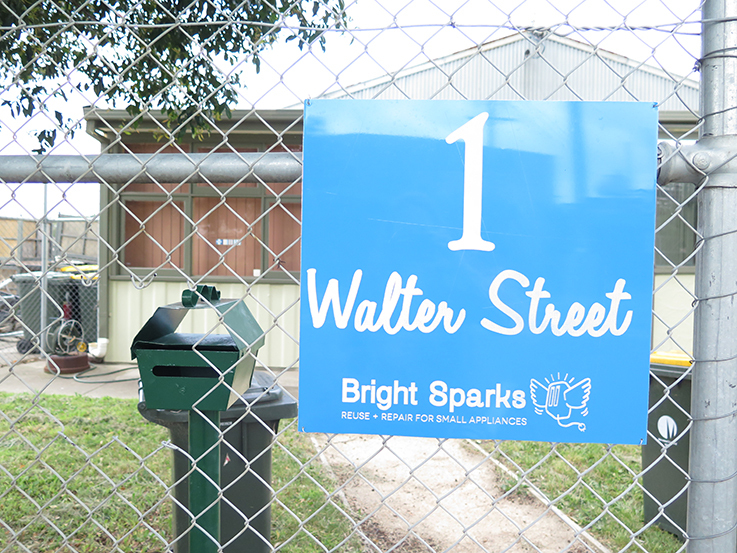 Bright Sparks has a qualified electrician on staff. Everything about the service was professional. I am pretty sure I talked the Builders ear off about how enjoyable my experience with Bright Sparks was. Supporting individuals and community really does give me the warm and fuzzies, that and keeping electrical appliances out of landfill. Did you know that electronic waste is one of the fastest growing waste streams in Australia? The good news is, if you would like to donate your unwanted items, there are now donation points available around the city of Melbourne. Each drop off point allows you and me, to sort into working and broken. This helps the staff know what they need to fix and what can be sold on. If goods cannot be fixed and sold on, they will be recycled. If you have an item you want repaired, you will need to go to their workshop in Hadfield. And if you are like me, without a car, you can walk from Fawkner Station (through the cemetery) or get a bus from Glenroy station. Repair works are guaranteed for 90 days. The website has a list of items accepted for donation and repair. They are also selling items on site too. I saw a hair curler, cute lamps and fans; just in time for an Aussie summer. Do you have repair services for small electrical goods in your area? How do you deal with broken electronics? This was an independent review. Bright Sparks has not asked me for a review or to write a post. I am only sharing what I think to be a genuine and needed service. 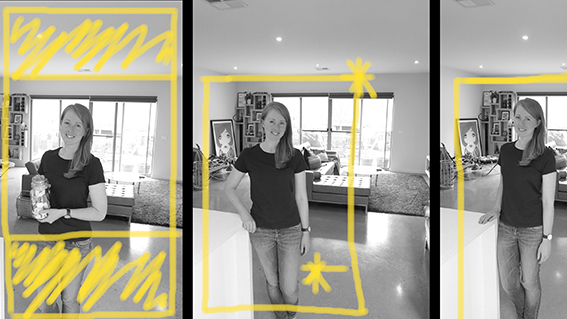 Last week, I was putting together a presentation for my first public speaking event with LiveWell Yarra. I got to a part of my talk, where I was going to discuss what benefits going plastic free and zero waste, has brought to my life. The last point, was one that I had never really focused on, whenever I would talk to new acquaintances about the perks of my lifestyle. 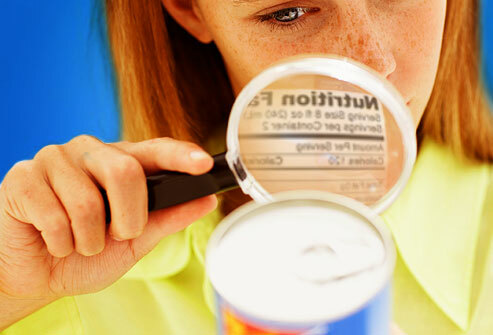 I would also look for the words vegetable oil, which is a way to disguise palm oil. Also I would check the country of origin – was it made in Australia with local or imported ingredients? 80% of my food comes from farmers market or a green grocer. No labels, unless it’s stating where the vegetable or fruit came from. 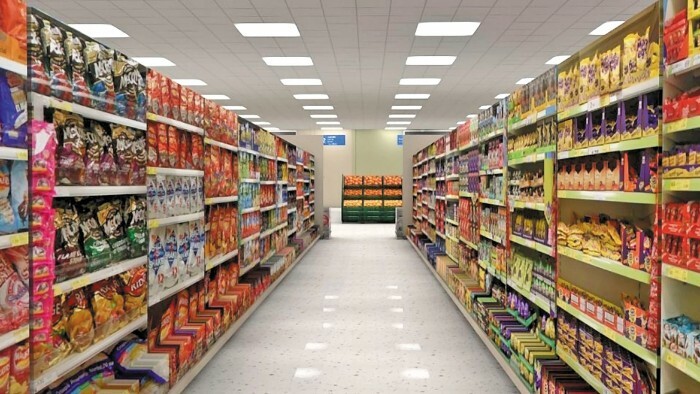 15% is bought from bulk stores where there is only a single ingredient in the food bins. There will be a label with the name of the item, where it comes from (usually somewhere in Australia) and if its gluten free or biodynamic. The remaining 5% is the readymade items I buy from the deli, like cheese or dolmades. Eating a diet high in vegetables and fruit is the easiest way to shop plastic free and zero waste. I can make my own version of anything I find in the supermarket and don’t have to worry about preservatives. For instance, last night I made mayonnaise. No longer wasting time reading food labels....I would definitely say that is a benefit of living plastic free and zero waste. What non obvious perks have there been in your plastic free or zero waste life?